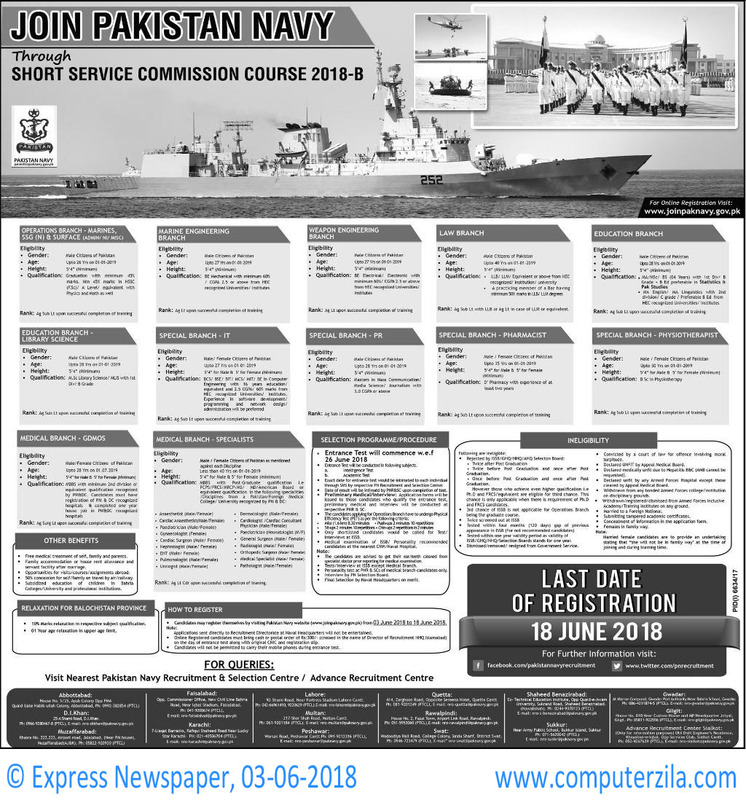 Short Service Commission Course 2018-B at Pakistan Navy (PN) in Abbottabad, Attock, Dera Ismail Khan, Faisalabad, Gilgit, Hyderabad, Islamabad, Karachi, Lahore, Multan, Peshawar, Quetta, Rawalpindi, Sialkot, Sukkur, Swat, Taxila, Wah, Ziarat, Muzaffarabad, and Gwadar Cities. Pakistan Navy is a Government Organization which requires employees for Administrative, Engineering, Law, Education, Medical, and Information Technology Jobs in cities Abbottabad, Attock, Dera Ismail Khan, Faisalabad, Gilgit, Hyderabad, Islamabad, Karachi, Lahore, Multan, Peshawar, Quetta, Rawalpindi, Sialkot, Sukkur, Swat, Taxila, Wah, Ziarat, Muzaffarabad, and Gwadar. Join Pakistan Navy Through Short Service Commission Course 2018-B. Pakistan Navy Offers jobs for Short Service Commission (SSC) in engineering, medical and IT Branches to graduates in Pakistan, if you have bachelors degree then you can apply for Jobs at Pakistan Navy.